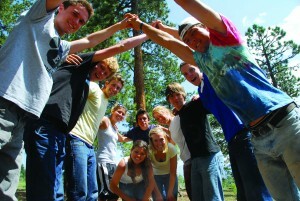 In serving, a teen discovers a spiritual foundation for global prayer. On the first day in the village, our guide, Selvy, introduced us to some of the locals we would be working with. With each new face, he spoke about their various life stories, highlighting the progress that each individual had made. Collectively, we stopped in the village of Pumamarca (where the 2014J class had worked the year before), and Selvy took us to a large building. Inside, we met a woman named Maria Flores, who had worked with [volunteer organization] Peru’s Challenge to build and earn her own greenhouse. Over the years she earned a living by selling flowers in the local market, feeding her family on her own. Entering the mud-brick structure, Selvy continued explaining the hardships Maria had overcome. As he did so, Maria quietly handed us each a rose from her garden. The roses she gifted to us were needed to make money, yet she gave them away without thought. This graceful act of humility left us stunned – a demonstration of gratitude in the highest form – and we hadn’t even been the ones helping her community. She was thanking us for the good she knew we would do, and for those who came before us. Leaving the greenhouse, I never thought I could feel so grateful for the opportunity to serve a community. During the days that followed, we were given the opportunity to visit the homes of some of the people we worked for, and my group was welcomed to visit Maria’s home. We entered quietly, unable to comprehend the drastic scene of poverty that lay before us. Her home was small, with very few possessions in sight. After speaking with Maria, we gathered outside her home to discuss what we were feeling. Together we prayed to deny the claims of guilt, poverty and lack. Meeting with the rest of the class, we sat down to write a treatment for the situation. I personally struggled with a sense of guilt and sadness, and I worked to know that God supplied all and that satisfaction was a divine law for each and every child of God. The pure joy that radiated off of each person we met was proof of this, and their material circumstance would never change their happiness. I saw that my own view was malpracticing, and changing my thought would be healing for all. Maria gifted us with humility, gratitude and an honest expression of supply. This was an occasion that gave me a foundation for praying for others (and for the world). I will never forget this lesson, and I will always be grateful for the countless moments such as this that I experienced while in NLC. There’s nothing like it, and the world is ready for the healers it supplies. Brooke was honored at her class graduation with both the Monitor Passport Prize and the peer-nominated Kevin Watters Award for Spiritual Integrity. The Monitor Passport Prize is part of the NLC’s fourth-year Global Perspectives curriculum and is awarded for the essay that best reflects these three points: 1) Section(s) of the Monitor the student found particularly inspiring or enlightening; 2) actions the student took in response to his or her Monitor reading; and 3) what the student learned about him- or herself and the world. 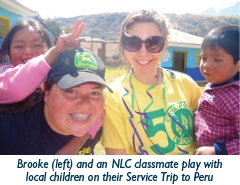 Read Brooke’s winning Monitor Passport Prize essay.